There is more than one way to appreciate Mistress Nell, and it depends, I think, on how many Mary Pickford films you’ve seen in your life. I’ve seen a lot of them. Enough to know the prototypical Pickford part when I see it: the plucky, forceful youth, the rough-mannered gem who knows herself and inspires the rest of us. And so I can say with confidence that if you like that kind of thing, and you’ve never seen a Pickford film before, Mistress Nell is a good one to start with. Pickford plays Nell Gwyn, the Restoration-era actress famed as the mistress of (well, as the most famous mistress of) King Charles II (Owen Moore). A figure known for her comic talents, beauty and wit, Gwyn was apparently deft at outmaneuvering would-be competitors for Charles’ eye, and so is remembered as something of a trickster figure, too. There was much for an actor to work with here and Pickford makes the most of it. She plays Nell as an independent woman—one who loves the king, but does not fear him, because she is confident in her own appeal. She’s even at ease teasing him. I liked an early scene in which Nell feigns a fall from a horse. The King, discovering her unconscious, betrays the depths of his affection. When she reveals the joke, he’s upset, but accepts her deep curtsey anyway. He has to—he’s the king. And that’s the point. Nell understands that the power which makes Charles king also binds him, and she revels in testing its limits. There’s a feeling here of youthful exuberance in this film, not just from Nell, but from the king as well. Here are two people reveling in a public love affair for which there can be no punishment, no scandal, because they are too powerful to be hurt. The only threat Charles faces is the Duchess of Portsmouth (Ruby Hoffman)—an aspiring companion who is also a French spy. (We’re informed of this fact in the opening minutes of the film.) But while the consequences for England are theoretically dire, in practice, the Duchess is a comedy foil. She’s someone for Nell to repeatedly thwart and humiliate for our entertainment. It’s interesting to watch Pickford, already an accomplished performer and star, play a character like this. Her Nell is constantly mimicking people: while this is a comic effect, in terms of what it offers the movie, it is also a legitimate part of any actor’s toolkit. And that gets you thinking about other ways that Pickford and Gwyn resembled one another. Both were the greatest stars of their era; both were trailblazing females in their medium; both maintained relationships with powerful men—and several of them. The press often described Pickford as Hollywood royalty; like Gwyn, she was considered a better comedienne than a dramatic actress. All this must’ve made the part intriguing for Pickford. And if you’re someone who has seen a lot of Pickford films, you’ll find the part intriguing too. Because you’ll see this character morph through various iterations of the Pickford stock character, but do so knowingly, as an actor would. Watch Nell in one scene, about halfway through the film, when she finds herself at an awkward three-person meal with Charles and the Duchess. In an effort to rattle the Duchess (and probably tweak the king), Nell begins acting up: she spears a whole chicken with her fork, reaches across the table for a bun and generally displays the kind to terrible table manners that so many of Pickford’s bumpkins and orphans did in other films. In other scenes you see the actress, who is quite capable of getting what she wants through charm or trickery, resort to violence (Pickford characters are often physically aggressive, at least early on). Nell even plays a male character one point—something Pickford occasionally did. This autobiographical element adds much to an otherwise average film. The stakes are rather low in Mistress Nell—one gets the impression that Nell could only lose the king’s attention if she became boring, and that seems impossible. The French plot, meanwhile, is so clumsily executed that Nell nearly defeats it by accident. 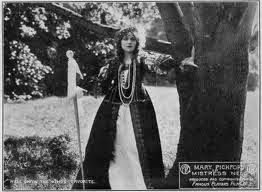 It is the strength of Pickford’s performance that makes Mistress Nell worth watching. Enjoy it as a series of comic vignettes, starring the biggest comedienne in the world, and don’t expect a story for the ages. Mistress Nell was screened on April 10, 2015, at Toronto’s Carlton Cinema—part of the 2015 Toronto Silent Film Festival. Live piano accompaniment was provided by Jordan Klapman.